Connections between large historic basaltic eruptions, and changes in the global environment have been long recognized. Dramatic examples include the eruptions of Laki, Iceland in 1783, and Eldgjá, Iceland in 934, both of which were followed in subsequent years by historically cold summers in the northern hemisphere with severe environmental consequences (Stothers, 1998; Thordarson and Self, 2003; Oman et al., 2006; Bressan, 2015; Fig. 1). For instance, the Laki eruption was followed by plague and famine in 1783-1784, during which an estimated nine thousand people died, one-fifth of the population of Iceland. More recently the 2010 volcanic eruptions of Eyjafjallajokull, Iceland, although relatively small, caused havoc for airline travel in western and northern Europe in April 2010 (https://en.wikipedia.org/wiki/2010_eruptions_of_Eyjafjallajökull). Taking a longer perspective, over the past few thousand years, human civilization has been dramatically influenced by volcanic-induced climate change (e.g. Harris and Mann, 2018) with periods of increased volcanic activity often leading to decreased global temperatures and linked to famine, population collapse, and wars. Figure 1. 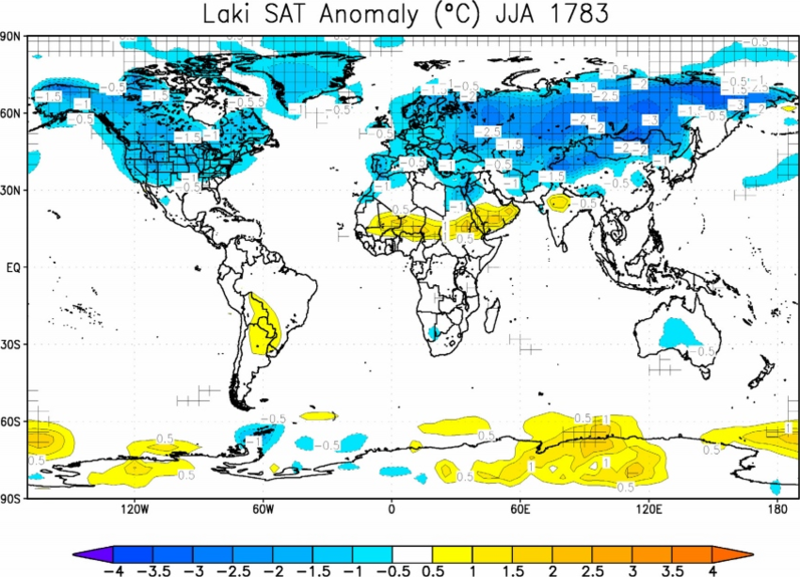 Seasonally averaged surface air temperatures (SAT) anomaly (oC) calculated for 1783, the summer of the Laki eruption. Note the dramatic cooling of a few degrees throughout the northern hemisphere. After Oman et al. (2006). These climate-changing volcanic events of Iceland are dwarfed by Large Igneous Provinces (LIPs) which represent much larger outpourings of basaltic magmas, up to millions of cubic kilometres (e.g. Coffin and Eldholm, 1994; Ernst, 2014). There is an increasing recognition of the role of LIPs and their silicic counterparts, Silicic LIPs (SLIPs), in rapid environmental and climate changes, including global warming (Hothouse events), global cooling (Icehouse events, i.e. Snowball Earth or regional glaciations), anoxia, stepwise oxygenation, acid rain/ocean acidification, enhanced hydrothermal and terrestrial nutrient fluxes, and mercury poisoning and leading to mass extinctions (e.g. Courtillot, 1999; Saunders, 2005; Wignall, 2005; Kerr, 2005; Self et al., 2005; Neal et al., 2008; Ernst and Youbi, 2017; Bond and Grasby, 2017). Specifically, the largest mass extinction events at 360, 252, 201, 66 Ma and probably also at 440 Ma can be linked to LIPs with an additional input from a meteorite impact only associated with the end Cretaceous (66 Ma) mass extinction. In this brief contribution, we discuss the emerging recognition of the role of LIPs as a major driver of climate change throughout Earth history. We then consider ways in which the historical record of climate change can be useful in modern studies of climate change. This is an initial commentary, and is meant to stimulate discussion on how lessons from Earth’s geological history and the LIP record throughout time can be potentially informative for modern climate change research. The precise definition of a LIP has varied, but generally emphasizes a huge volume of mafic magma emplaced in a short period and which is of intraplate style (e.g. Coffin and Eldholm, 1994; Bryan and Ernst, 2008; Bryan and Ferrari, 2013; Ernst, 2014; Ernst and Youbi, 2017). The following definition is modified after Ernst (2014) and Ernst and Youbi (2017). LIPs represent large volume (>0.1 Mkm3; frequently above 1 Mkm3), mainly mafic (-ultramafic) magmatic events of intraplate affinity (based on tectonic setting and/or geochemistry) that occur in both continental and oceanic settings, and are typically either of short duration (<5 Ma) or consist of multiple short pulses that occur over a maximum of a few 10s of Ma. LIPs consist of volcanic packages (flood basalts) and a plumbing system of regional dyke swarms (linear, radiating and a newly identified circumferential type), sill complexes, layered mafic-ultramafic (M-UM) intrusions, and crustal magmatic underplates. Continental LIPs can also be associated with major silicic magmatic events termed Silicic LIPs (SLIPs), as well as carbonatites and kimberlites. LIP events occur at variable rates through time. Since 2500 Ma, there has been an average of one LIP event every 20–30 Ma, with higher numbers of LIPs occurring during supercontinent breakup (Ernst and Bleeker, 2010). The rate of LIP occurrences in the Archean, however, is less certain due to poorer preservation. Large Igneous Provinces (LIPs) have been the focus of a significant amount of recent research not only for their role in dramatic climate change (the focus of this contribution), but also given their growing importance in constraining paleocontinental reconstructions (e.g., via magmatic bar-coding, Bleeker and Ernst, 2006; Ernst et al., 2013; and via paleomagnetism of mafic rocks; Buchan, 2014), as a tool in exploration targeting (e.g. Ernst and Jowitt, 2013, 2017), and as analogues for voluminous planetary intraplate magmatism (e.g. Head and Coffin, 1997; Ernst et al., 2017). Figure 2. Global LIPs barcode record with selected labelling (after Fig. 2 in Ernst and Youbi, 2017). LIPs are identified by red lines. Selected LIPs are identified by name, followed by location information: Am = Amazonia, AS = Asia, AU = Australia, CA=Central America, CC = Congo craton, EU = Europe, gLau = Greenland portion of Laurentia, Lau = Laurentia, Bal = eastern Baltica, SFC = Sao Francisco craton, Kal = Kalahari craton, Kap = Kaapvaal craton, KKC = Karelia-Kola craton, NA = North America, NAC = North Australian craton, NC = Nain craton, PA = Pacific, Pil = Pilbara craton, SA = South America, Sib = northern Siberian craton, Sla = Slave craton, Sup = Superior craton, WAC = West African craton, Wyo = Wyoming craton, Yil = Yilgarn craton, Zim = Zimbabwe craton. Names for Silicic LIPs are shown in red, continental LIPs in black, and oceanic LIPs in blue. See also www.largeigneousprovinces.org/18mar. Figure 3. 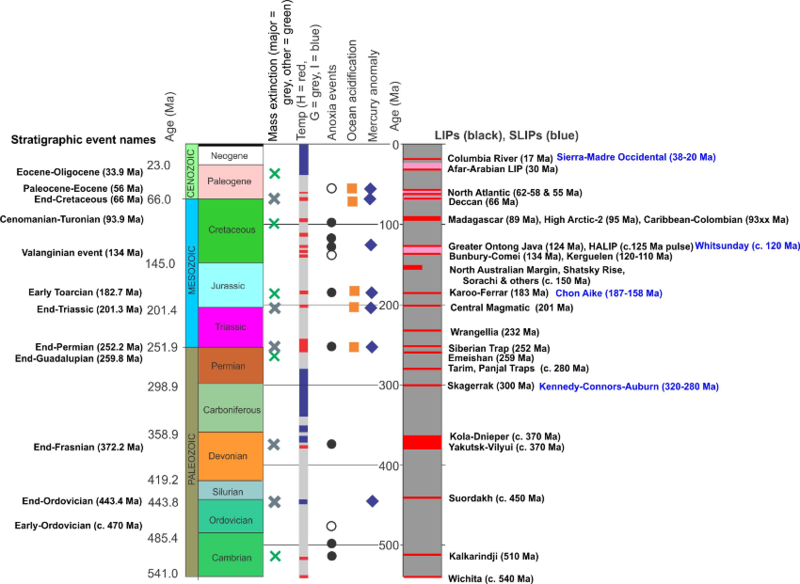 Phanerozoic record of mass extinctions, temperature conditions (Hothouse (H), Greenhouse (G), Icehouse (I)), oceanic anoxic events (OAE) and mercury/TOC anomalies compared to the Phanerozoic LIP record, incorporating the environmental data presentation style of Percival et al. (2015). Open circles represent carbon-isotope excursions and/or black shales not recognized as OAE. 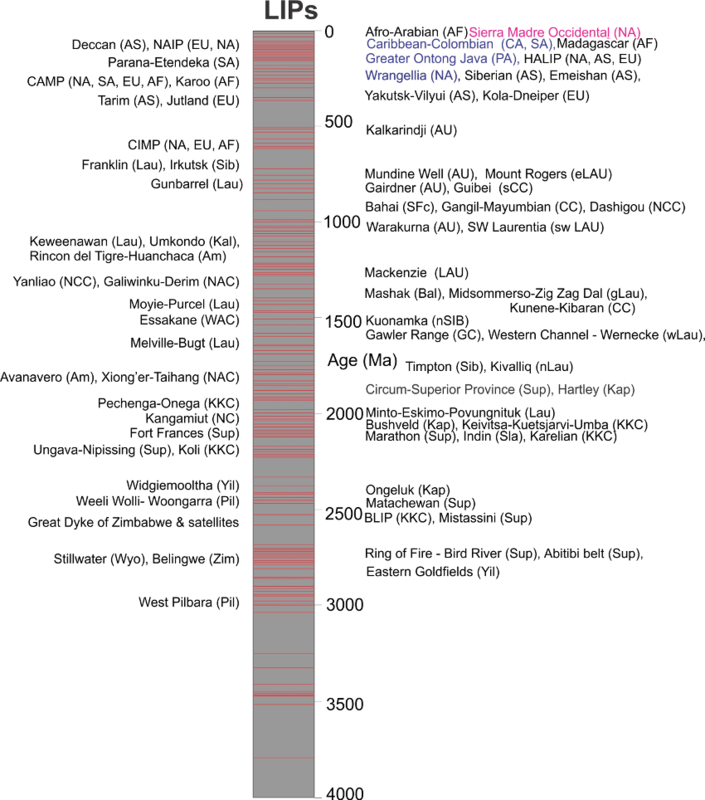 LIPs are marked by red bars and their lower volume continuations by pink bars. After Fig. 4 in Ernst and Youbi (2017). The environmental effects of LIPs are caused by gas release both via volcanism, and also from interaction of the intrusive component with host sediments that leads to hydrothermal venting (e.g. Svensen et al. 2009). Additional factors include chemical weathering, ash clouds affecting Earth’s albedo, and the release of reductants, nutrients, and metals to the ocean. It is also important to consider the interactions between the effects of LIPs and SLIPs (both direct and indirect) and other proposed drivers of climatic change (such as new ocean formation, erosion of mountain belts, meteorite impact, biological evolution, obliquity cycles, and changes in planetary albedo, ocean circulation, and solar luminosity). Publications such as Okulitch (1987, 2002) and Bleeker (2004a, 2004b) as well as the comprehensive review by Van Kranendonk et al. (2012) have argued for a revised Precambrian time scale based on natural chronostratigraphic boundaries (in some cases correlated with LIPs) to replace the current chronometric scale (e.g. Ogg et al., 2016) that uses numbers rounded mainly to the nearest 100 Myr. The robust array of LIP-related environmental effects (as demonstrated in the Phanerozoic record) suggests that LIP events represent useful time markers in the Precambrian as proxies for significant global environmental changes that are preserved in the sedimentary record. The potential of LIP events to cause severe global environmental impacts means they can represent proxies for “golden spike” horizons in the sedimentary record. One contribution toward the identification of appropriate natural boundaries is provided by an examination of the Proterozoic record for LIP candidates to mark such boundaries (Table 1 in Ernst and Youbi 2017). LIPs at 2500–2450, 2100, 2060, 1880, 1790–1750, 1525–1500, 1460, 1380, 1270, 1110, 825, 720, 615–560, 510 Ma (Table 1) are of particular significance both for their scale and extent. Although LIP size is not the only factor in their potential impact on climate it remains an important first-order parameter. In terms of the range of possible LIP-climate links there are lessons from other planets, both within our solar system and also extra-solar planets. Modelling by Way et al. (2016) inferred that Venus had a habitable climate at equatorial latitudes from about 3 Ga to 700 Ma, at which point dramatic global climate change occurred, with surface temperatures increasing to c. 450°C and atmospheric pressures to 90 bar (dominated by CO2). This runaway climate change was linked to voluminous basaltic volcanism and associated CO2 release (e.g. Solomon et al. 1999). On Mars, intense volcanism and associated release of CO2, H2O and SO2 led to episodic global warming early in Mars history (e.g. Grott et al. 2011; Halevy and Head 2014; Wordsworth, 2016). Figure 4. The TRAPPIST-1 planetary system. Gillon et al. (2017) have discovered seven Earth-sized planets in orbit around the nearby dwarf star TRAPPIST-1. 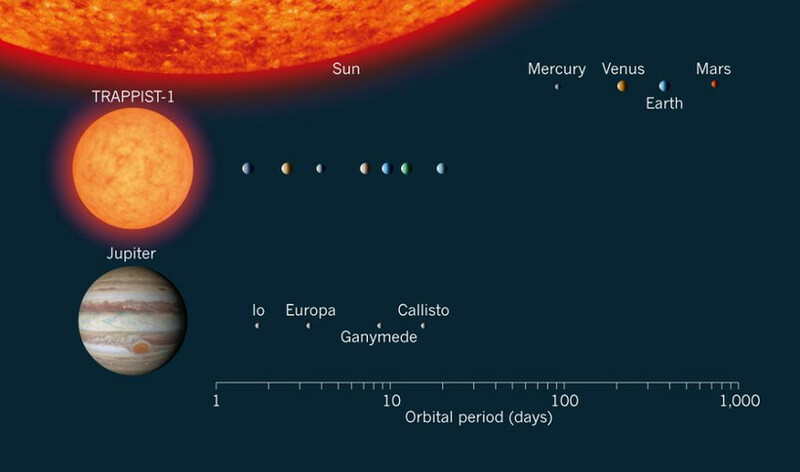 Shown here are the measured orbital periods of the planets, compared with those of Jupiter’s Galilean moons and the four inner planets of the Solar System. The sizes of all the objects are approximately to scale. After Snellen (2017). The atmospheres of extrasolar planets will be revealed through future space missions, such as the upcoming James Webb Space Telescope mission which will be launched in 2021 (https://jwst.nasa.gov/index.html), and strategies for detecting volcanism on extrasolar planets are also being developed (e.g. Kaltenegger et al., 2010). Thus, future data from extrasolar planets on climate and volcanism will represent another source of information for better understanding the parameter space for climate, volcanism and conditions for maintaining life. One of the aspects of the LIP record that is most relevant to understanding modern climate change relates to role of LIPs as carbon sinks. Weathering of basalts is known to be an efficient mechanism for CO2 drawdown (Pollyea et al. 2014) and suggest the role of mafic units of LIPs in carbon sequestration (e.g. Tollefson, 2013; Giacomel et al., 2018). It is also now recognized that the ultramafic components of LIP can even more efficiently sequester CO2 during mineralogical changes associated with serpentinisation (Wilson and Jowitt 2014; Wilson et al. 2009, 2014). One example of this is the natural sequestration of CO2 by ultramafic mine tailings, as exemplified by the tailings associated with the komatiitic Mount Keith nickel mine in Western Australia, which is part of the Kambalda sequence of the 2700 Ma Eastern Goldfields LIP. Natural sequestration of CO2 is a result of the passive weathering and carbonation of these Mount Keith mine tailings and offsets some 11% of the annual greenhouse gas emissions associated with mining and nickel production (Wilson et al., 2014). The CO2 sequestration potential of LIP intrusions is also being actively investigated, with research currently underway to make use of pyroxene-rich mafic tailings from PGM mines in the Bushveld LIP as a feedstock for industrial carbonation reactors (e.g., Meyer et al., 2014). Earth’s history of dramatic climate change, linked to LIPs, provides some lessons for modern climate change. Research integrating LIPs and environmental consequences contributes to a fuller characterization of how the Earth responds and recovers from severe environmental stressors, with implications for understanding and mitigating modern climate change. More broadly, Earth’s history of climate change (regardless of cause) can provide a robust context for modern climate change without diminishing the impact of anthropogenic drivers in the latter. One example of this is the weathering of mafic and ultramafic rocks, processes that act as powerful sinks for atmospheric CO2, and thus have suggested a role for these rock types in carbon sequestration efforts. A simple cautionary tale is that the Earth has experienced many periods of dramatic climate change, some of which resulted in mass extinction events where a majority of life on Earth was wiped out. Many of these dramatic climatic shifts are linked to LIPs, but in the context of this essay, the more important message is that Earth’s climate is continually changing, sometimes dramatically, with catastrophic effects on life, and therefore, the risk to humanity is real. Bleeker, W. (2004a). Towards a “natural” Precambrian time scale. In: Gradstein, F.M., Ogg, J.G., Smith, A.G. (Eds. ), A Geologic Time Scale 2004. Cambridge University Press, Cambridge, pp. 141–146. Bleeker, W. (2004b). Towards a “natural” time scale for the Precambrian—a proposal. Lethaia, v. 37, p. 219–222. Bleeker, W. and Ernst, R. (2006). Short-lived mantle generated magmatic events and their dyke swarms: the key unlocking Earth’s paleogeographic record back to 2.6 Ga. In Hanski, E., Mertanen, S., Rämö, T., Vuollo, J. (eds. ), Dyke Swarms – Time Markers of Crustal Evolution. London: Taylor and Francis/Balkema, pp. 3–26. Bryan, S. and Ernst, R.E. (2008). Revised definition of Large Igneous Provinces (LIPs). Earth-Science Reviews, v. 86, p. 175–202. Bryan, S.E. and Ferrari, L. (2013). Large Igneous Provinces and Silicic Large Igneous Provinces: progress in our understanding over the last 25 years. Geological Society of America Bulletin, v. 125, p. 1053–1078. Buchan, K.L. (2014). Reprint of “Key paleomagnetic poles and their use in Proterozoic continent and supercontinent reconstructions: A review”. Precambrian Research, v. 244, p. 5-22. Coffin M.F., and Eldholm O. (1994). Large igneous provinces: crustal structure, dimensions, and external consequences. Review of Geophysics, v. 32, p. 1-36. Ernst, R.E., and Bleeker, W. (2010). Large igneous provinces (LIPs), giant dyke swarms, and mantle plumes: significance for breakup events within Canada and adjacent regions from 2.5 Ga to the Present. Canadian Journal of Earth Sciences, v. 47, p. 695–739. Ernst R.E. and Jowitt S.M. (2013). Large igneous provinces (LIPs) and metallogeny. In: Colpron M. et al., eds. Tectonics, metallogeny, and discovery: The North American Cordillera and similar accretionary settings. Society of Economic Geologists Special Publication, v. 17, p. 17-51. Ernst, R.E., and Youbi, N. (2017). How Large Igneous Provinces affect global climate, sometimes cause mass extinctions, and represent natural markers in the geological record: Palaeogeography, Palaeoclimatology, Palaeoecology, v. 478, p. 30-52, doi.org/10.1016/j.palaeo.2017.03.014. Ernst, R.E., Bleeker, W., Söderlund, U., and Kerr, A.C. (2013). Large Igneous Provinces and supercontinents: Toward completing the plate tectonic revolution. Lithos, v. 174, p. 1–14. Ernst, R.E., Buchan, K.L., Jowitt, S.M., and Youbi, N. (2017). Applying the terrestrial Large Igneous Province (LIPs) context to planetary intraplate magmatism. Lunar and Planetary Science Conference XLVIII, abstract 1373. Grott, M., Morschhauser, A., Breuer, D., and Hauber, E. (2011). Volcanic outgassing of CO2 and H2O on Mars. Earth and Planetary Science Letters, v. 308, p. 391-400. Halevy, I., and Head, III, J.W. (2014). Episodic warming of early Mars by punctuated volcanism. Nature Geoscience, v. 7, p. 865–868. Head, J.W. and Coffin, M.F. (1997). Large Igneous Provinces: a planetary perspective. In: Mahoney, J.J., and Coffin, M.F. (eds.) Large Igneous Provinces: Continental, Oceanic and Planetary Flood Volcanism. AGU Geophysical Monograph, v. 100, p. 411–438. Kerr, A.C. (2005). Oceanic LIPs: The Kiss of Death. Elements, v. 1, p. 289-292. Meyer, N.A., Vögeli, J.U., Becker, M., Broadhurst, J.L., Reid, D.L., and Franzidis, J.-P. (2014). Mineral carbonation of PGM mine tailings for CO2 storage in South Africa: A case study. Minerals Engineering, v. 59, p. 45–51. Ogg, J.G., Ogg, G., and Gradstein, F.M. (2008). The Concise Geologic Time Scale. Cambridge University Press (177 pp.). Ogg, J.G., Ogg, G.M., and Gradstein, F.M. (2016). A Concise Geologic Time Scale 2016. Elsevier 243 pp. http://dx.doi.org/10.1016/B978-0-444-59467-9.00008-X. Okulitch, A.V. (1987). Proposals for time classification and correlation of Precambrian rocks and events in Canada and adjacent areas of the Canadian Shield; part 3: a Precambrian time chart for the Geological Atlas of Canada. Geological Survey of Canada, Paper 87-23. Oman, L., Robock, A., Stenchikov, G.L., and Thordarson, T. (2006). High-latitude eruptions cast shadow over the African monsoon and the flow of the Nile. Geophysical Research Letters, v. 33, L18711, doi:10.1029/2006GL027665. Self, S., Thordarson, T., and Widdowson, M. (2005). Gas Fluxes from Flood Basalt Eruptions. Elements, v. 1, p. 283-287. Solomon, S.C., Bullock, M.A., and Grinspoon, D.H. (1999). Climate change as a regulator of tectonics on Venus. Science, v. 286, p. 87–90. Svensen, H., Planke, S., Polozov, A.G., Schmidbauer, N. Corfu, F. Podladchikov, Yu.Y., Jamtveit, B. (2009). Siberian gas venting and the end-Permian environmental crisis. Earth and Planetary Science Letters, v. 277, p. 490–500. Van Kranendonk, M.J., Altermann, W., Beard, B.L., Hoffman, P.F., Johnson, C.M., Kasting, J.F., Melezhik, V.A., Nutman, A.P., Papineau, D., and Pirajno, F. (2012). A chronostratigraphic division of the Precambrian: possibilities and challenges. In: Gradstein, F.M., Ogg, J.G., Schmitz, M. (Eds. ), The Geologic Time Scale. 2012: pp. 299–392. http://dx.doi.org/ 10.1016/B978-0-444-59425-9.00016-0. Way, M. J., A. D. Del Genio, N. Y. Kiang, L. E. Sohl, D. H. Grinspoon, I. Aleinov, M. Kelley, and T. Clune (2016). Was Venus the first habitable world of our solar system?, Geophysical Research Letters, v. 43, p. 8376–8383, doi:10.1002/2016GL069790. Wilson, S.A., Dipple, G.M., Power, I.M., Thom, J.M., Anderson, R.G., Raudsepp, M., Gabites, J.E., and Southam, G. (2009). Carbon dioxide fixation within mine wastes of ultramafic-hosted ore deposits: Examples from the Clinton Creek and Cassiar chrysotile deposits, Canada. Economic Geology, v. 104, p. 95–112. Wilson, S.A., Harrison, A.L., Dipple, G.M., Power, I.M., Barker, S.L.L., Mayer, K.U., Fallon, S.J., Raudsepp, M., and Southam, G. (2014). Offsetting of CO2 emissions by air capture into mine tailings at the Mount Keith Nickel Mine, Western Australia: Rates, controls and prospects for carbon neutral mining. International Journal of Greenhouse Gas Control, v. 25, p. 121–140. Wordsworth, R.D. (2016). The climate of early Mars. Annual Review of Earth and Planetary Sciences, v. 44, p. 1-31.